If you intend to do your Christmas shopping in Italy, don’t just hit the cities—there are plenty of lovely Christmas markets laden with cakes, wooden statues and handmade baubles waiting to be discovered. Can you feel it already? Days are getting shorter and colder, the warm aroma of roasting chestnuts fills the streets in town and, in the countryside, bare tree branches stretch towards a leaden sky over a crackling carpet of falling leaves. Christmas is coming. And if you plan to bring some Italian festive cheer into your home, now is the time to go. You can obviously hit the cities for a spot of shopping—Rome, Milan and Florence are particularly lively in December, with great light displays, but if you want something different, handcrafted and more traditionally Italian, consider a tour of the Christmas markets. We tend to think of Christmas markets as a quintessentially Northern and Middle European tradition belonging to Scandinavia, Germany, Austria. However, Italy has many lovely markets, partly of Austro-German heritage, especially in the mountain villages of Northern regions such as Trentino Alto Adige and Veneto, but also linked to the religious culture of the South, in places like Naples and Lecce. From Arco to Vipiteno, stalls groan under the weight of made candles and rag dolls, flaky apple strudels and golden, honey-coated struffoli, wooden sculptures (across the Alpine arc) and nativity statuettes (in Campania and Puglia). Here is our pick of the three you should definitely include in your tour. The Christmas market tradition is most established in Trentino Alto Adige and the region has such a wide choice of lovely markets that picking one over the others is hard. However, Arco is a particularly good one to visit if you have children. The lush 19th century gardens of the Lake Garda town turn into an enchanted place where tiny wooden huts are laden with stars, toys, dolls, books, chocolate and sweets. A special Christmas train will take families around the old town and children will be able to meet Father Christmas and his reindeers. Even Arco’s own walls will become part of the festive atmosphere—an Advent Calendar will be projected on the façades of its ancient palazzos. On 8 December, a special firework display will take place in the crenellated castle that overlooks the town, while just outside, in the village of Bolognano d’Arco, fifty nativity scenes will decorate the streets. Grown-ups will enjoy the stalls full of baubles, candles, wooden statues, ceramics and glass objets, which pepper the streets of Arco’s old town centre. And gourmets can have a taste of Trentino in Arco’s casino where the Typischer Hof will serve bauernknödel, würstel, polenta and hot chocolate. 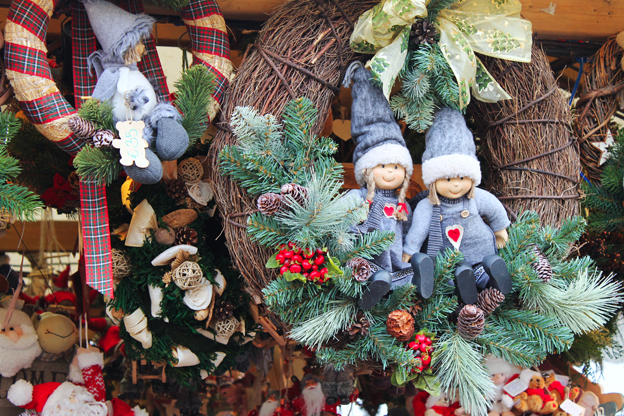 The Arco Christmas market takes place on Friday, Saturday and Sunday from 21 November to 6 January 2015, on 8, 22 and 23 December, and every day from 26 December to January 6 (click here for more information). If you like this, also try: Mercatino di Natale di Bolzano, where eighty stalls sell glass, ceramic and wooden objects, Christmas cakes and mulled wine among the 1000 lights of Piazza Walther from 27 November to 6 January. Narrow lanes lined with earth-hued houses climb up a steep hill to the powerful bulk of an early medieval fortress: the small village of Sant’Agata Feltria, in Le Marche, looks straight out of a fairy tale at any time of the year. In December, however, it becomes even more special because it turns into a miniature Christmas village. Piazza del Mercato becomes home to Father Christmas, his reindeer and his elves, drawing children from all over Le Marche and neighbouring Romagna, who flock to Sant’ Agata to hand their letters to Father Christmas’ own PA. But there is much for grown-ups too—stalls are crammed full with baubles and honey, mistletoe wreaths and truffles, statuettes and formaggio di fossa. The scent of candles, the music of bagpipes and hundreds of Christmas lights fill the streets. Traditional nativity scenes enliven the village’s oldest street, Via Battelli, and the neighbouring Piazza Garibaldi, music performances take place in the ancient theatre, and the restaurants serve special Advent dishes, think cappelletti in beef broth, chicken stuffed with chestnuts and truffled ravioli, for a gastronomic tour of the region’s Christmas fare tradition. Il Paese del Natale takes place on 30 November and 7, 8, 14 and 21 December (click here for more information). If you like this, also try: Candele a Candelara, a Christmas market with a difference in Le Marche. Stalls sell handmade candles in every shape, colour and size (as well as statuettes, baubles and objets). There are street artists, bag pipe players, jugglers, concerts, Father Christmas riding on horseback, and candlemaking labs. Best of all, electricity is switched off twice a day (at about 5.30pm and 6.30pm) and the village is lit only by hundreds of candles. November 29-30, December 6-7-8, 13-14. More than a market, a whole part of the city comes alive at Christmas time: the narrow alleys of San Gregorio Armeno and San Biagio dei Librai are crammed full of stalls selling nativity scene statuettes. Setting up a nativity scene —presepe in Italian and o' presebbio in Neapolitan— is a historic tradition in Naples. First recorded in the 11th century, the presebbio became a sumptuos display of both religious and secular figures by the 17th and 18th centuries. Today, Neapolitan artisans make the best nativity scene statuettes in Italy, usually out of terracotta, and skills are passed down from father to son—there are several third or fourth generation makers. Statuettes range from classic nativity characters—the Virgin Mary, Saint Joseph, baby Jesus, the Three Wise Men—to figures of the Neapolitan tradition—the fisherman, the wine maker and the two old friends, zi’ Vicienzo and zi’ Pascale—and even politicians and international stars. Indeed, it is considered an honour for an Italian celebrity to make it into the presebbio. 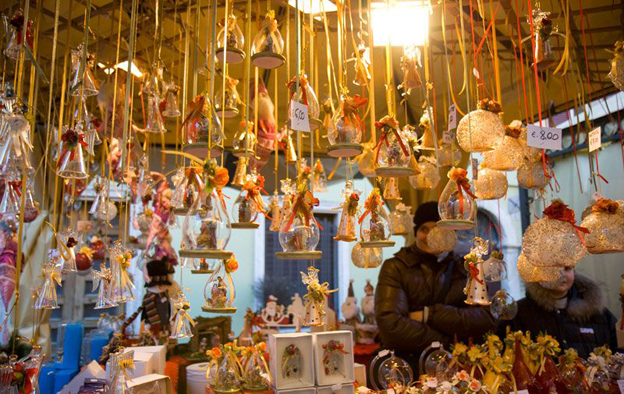 Beyond stocking up on statuettes and nativity accessories, however, you can also buy ceramics, embroidery, glass and decorations at the handmade and collectables Christmas market in Villa Comunale, Via Caracciolo, from 5 to 28 December. While in Naples, don’t forget to visit the Church of San Lorenzo Maggiore (for tiny nativity scenes set inside walnut shells); Piazza San Gaetano (for living nativity scenes) and the Museo di San Martino, which hosts Naples’ largest collection of nativity scenes and statuettes, from the colossal Cuciniello to the elegant Giustiniani and a precious silver and coral one. 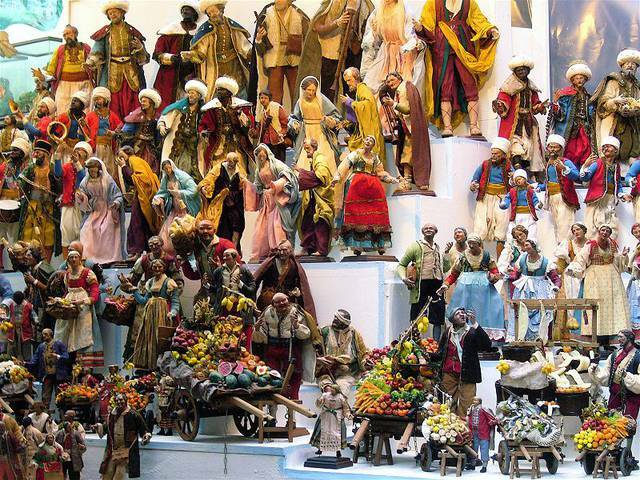 If you like this market, also try: Fiera dei Pupi e del Presepe, in Piazza S. Oronzo and Piazza Duomo, Lecce, for papier mache nativity scene statuettes. From 13 to 24 December.